Kate was born, raised, and educated in St. Louis, MO. As the youngest of four, she has always followed her older siblings expect when it comes to weather. Most of her family is in the health field, but Kate’s love for weather led her to pursuing a career in meteorology. 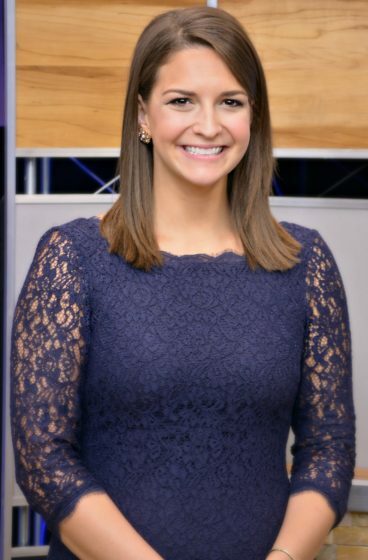 After graduating from St. Louis University with a Bachelor of Science in Meteorology, Kate became the Weekend Meteorologist and Weekday Reporter for WDTV in Bridgeport, WV. After just over a year, Kate was promoted to Morning and Noon Meteorologist. Kate is thrilled to be joining the WeatherNation team. Besides weather, Kate loves spending time outside with her Mini Goldendoodle, Walter. When not outside, Kate loves to keep up with a number of television shows, listening to some of her favorite podcasts, or watch the St. Louis Cardinals play (and hopefully win). Growing up in St. Louis, MO, I got to experience all types of weather. My love for weather started young. My grandma would babysit us and always have the weather on so I like to say my fascination started there. Once I started picking up golf, I became an even bigger weather enthusiast. I would constantly be checking the forecast before hitting the links then checking the radar while playing. It still amazes me that I get to live out my hobby for my profession. During my first year as a broadcast meteorologist in West Virginia, the state was hit by a major winter storm. That weekend, we received over 2 feet of snow in the lowlands and much, much more in the mountains. That was the most snow I have ever seen in my entire life. I basically moved into the station that weekend. Even my dog Walter was there roaming the studio and playing in the snow. I’ll never forget doing round the clock coverage with my coworkers as well as taking some breaks to play in all that snow. When I'm not tracking the weather, I love to spend time outdoors. Whether it's taking my dog Walter for a walk or checking out a state park, being outdoors rejuvenates me. Even though I love being outdoors, I also love to just hang out on the couch while keeping up with the newest movies or my favorite TV shows. I also wouldn't be able to call myself a St. Louis native without having a passion for the St. Louis Cardinals. My siblings and I are a very close group, so I am probably the most influenced by my two sisters. I always looked up to them while growing up. Whatever Mary Beth or Carolyn did, I did. I will always be thankful for them always including me in their big sister activities, allowing me to wear matching outfits and guiding me to become the person I am today. There’s usually not a day that goes by when I’m not calling them asking for their advice on some matter. I have an irrational fear of birds. There is no explanation for it. I know they aren’t going to hurt me, but I can’t help ducking down whenever a bird flies anywhere near me. For most, a trip to the beach is relaxing. Not when seagulls are flying around though! Weather impacts everyone. It doesn't care about your age or socioeconomic status. No matter who you are, the forecast affects you. I hope to give you all the details you need to know to keep you safe and prepared, but I also hope you walk away having learned something.